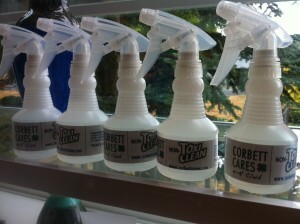 Windows get dirty, but you don’t need to reach for chemical cleaners to return them to a sparkling shine. Use natural, nontoxic ingredients such as vinegar, baking soda and lemon juice to clean and polish windows. 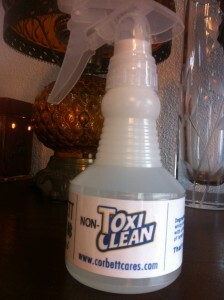 Chemical window-cleaning agents contribute to environmental damage and can contribute to indoor air pollution. Under the Federal Hazardous Substances Act, household cleaners are the only household products for which manufacturers are NOT required to list all ingredients. This makes it very difficult for the consumer to fully evaluate which products are the safest to use in their home. If the manufacturer does include an ingredient statement it is voluntary and in many cases this disclosure is inaccurate and incomplete. There are also about 9,000 chemicals on the market that have not been tested. You can select here to download a pdf with a list of common household cleaners and their corresponding non-toxic, easy to make and refill at home ingredients! Equal parts white vinegar and water with lemon juice to help with fragrance and cleaning power. The below ingredients are commonly found in cleaning products. Listed to the right are some of the concerns and possible dangers of these chemicals. Dyes - Have been linked to cancer, can be toxic to animals, slow to biodegrade. Alcohol – Respiratory and skin irritant, flammable, can act as an aggressive solvent which may damage surfaces in the home. Synthetic Fragrance – Central nervous system depressant, respiratory and skin irritant, slow to biodegrade, toxic. Sulfates (such as SLS & SLES) and/or sulfanates – Irritating to skin and eyes, may contain 1,4-Dioxane. Ethoxylates (Petroleum Based Cleaning Agents) - Ethylene oxide/petroleum based, may contain1,4-Dioxane, many pose threat to marine life, linked to cancer and sterility. Petrochemical Solvents – Petroleum based, many are respiratory and skin irritants, toxic, may damage surfaces in the home. We want a plug-in car!